Finally a thin-and-light gaming notebook that doesn't compromise on performance. The new generation of Max-Q laptops finally offer top-end performance in a portable, thin and light frame. I've spent a lot of time with gaming laptops lately. For the past six months, I've spent time with more than a dozen machines—benchmarking, playing games, and generally working—to determine the best gaming laptop. In my testing, what stuck out to me more than anything is that gaming laptops are thinner and lighter than ever. 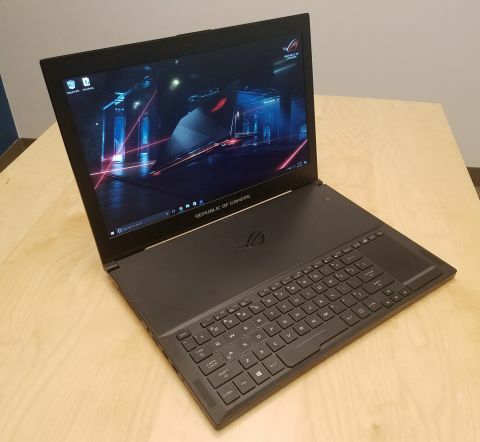 Thanks in large part to Nvidia's Pascal architecture (the GTX 10-series GPUs), which offer excellent performance at lower temperatures than generations past, the latest crop of gaming laptops can offer excellent performance in a shell that's thin and light, free of gigantic, bulky fans. At least, that's what I said before testing Asus's new ROG Zephyrus. The Zephyrus puts them all to shame. At Computex this year, Nvidia revealed its new "Max-Q" design philosophy. In short, Max-Q is centered around finding the right balance between power and efficiency in order to put high-performance graphics cards into the thinnest notebooks possible. What this means in practice is a "Max-Q" GTX 1080 is less powerful than its desktop equivalent, but in exchange for vastly improved thermals. Asus's ROG Zephyrus, available now, is the first Max-Q laptop I've tested, and it delivers on that promise of thin, quiet, powerful gaming. It's one of the thinnest laptops—measuring only 20 mm thick while closed—I've ever used, while maintaining the power of significantly bulkier laptops. Now, to be clear, the Zephyrus's GTX 1080 is not as powerful as a desktop GTX 1080—or even one found in a (much bulkier) non-Max-Q laptop. I found it to be about 5 to 10 percent more powerful than most of the GTX 1070 laptops I recently tested, but about 10 to 15 percent less powerful than the ("normal") GTX 1080 laptops—more on that later. What it loses in raw power, the ROG Zephyrus makes up for in size and sound. The Zeph is significantly quieter than any laptop I've tested—thin or not. At full load, the fans were only slightly audible—a stark contrast to every other "thin-and-light" laptop I've tested, all of which trade their small frames for a loud audio footprint. More impressively, all of these other "thin-and-lights" have mostly sported GTX 1060 (or below) GPUs, meaning that even if the Zeph's GTX 1080 is underpowered compared to a desktop GTX 1080, it's still vastly more powerful than everything else that's thus far been called "thin and light." To keep temperatures cool (and stay quiet in the process), the Zephyrus has a somewhat awkward keyboard layout that gives way to a rather ingenious cooling solution. The keyboard is located right at the front of the chassis—where the touchpad and wrist rests are normally situated—with the touchpad smushed over to the right. This leaves the top half of the chassis—where the keyboard would normally sit—for a meshed ventilation area. A number of fans sit here, sucking in air to cool the GPU before being spit out the back through a gap that opens up when the laptop is open. The keyboard layout is a bit awkward to use (the Zeph actually comes boxed with an external rubber wrist rest to improve things a little), but far from totally unusable. More than anything, it means you'll situate the Zephyrus a few inches back on your desk than a normal laptop, which might be an issue if you're lacking in desk real estate. Similarly, it's even more awkward trying to use it on your lap, though I wouldn't recommend doing so in the first place on account of the heat being spit out the rear vent. In addition to the Max-Q GTX 1080, the ROG Zephyrus has all the standards of a current-gen gaming laptop: Intel Core i7-7700HQ CPU, 512 GB SSD, 16GB RAM. It also features a 15.6-inch anti-glare wide-view panel with a 1080p resolution, 120Hz refresh rate, and Nvidia's G-Sync technology. Those final two bits are the most important, I think, as aiming for a higher framerate at 1080p is a much better use of GPU power than attempting to run games at higher resolution. Let's look at some numbers. To show relative performance, I'm going to compare the ROG Zephyrus and its Max-Q GTX 1080 to the following: our favorite GTX 1070 laptop, Asus's ROG Strix GL502VS; a "normal" GTX 1080 laptop, the Alienware 17; and a desktop GTX 1080 system, the Corsair One. As you can see, the Zephyrus outperforms the GTX 1070 laptop in gaming tests by about 5 to 10 percent, but falls short of the full-size laptop or desktop GTX 1080 systems by 10 to 15 percent. Of course, as I've gone over, the trade-off in performance is more than made up for by the Zephyrus's sleek frame. Speaking of that frame, it's freaking gorgeous. The all-metal chassis is finished with a brushed steel look that only slightly hints at the aggressive aesthetic that plagues many gaming laptops and peripherals. Here, the look is sleek, classy, and understated in a way that will turn heads without screaming "gamer." Of course, all that greatness is not without drawbacks, primarily cost. The ROG Zephyrus starts at $2,699, which sounds like a lot for its level of performance (by comparison, the ROG Strix GL502VS it barely outperforms is roughly $1,000 cheaper.) But in this case, you're paying for the convenience of a sleek, tiny frame and the engineering of keeping everything cool and quiet. To my mind, that's money well spent.